Happy Birthday to me! Last Thursday (4th March) was the big day. 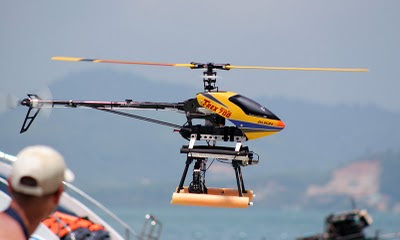 I tend not to celebrate the passing years, but this year enjoyed a great day out on the water playing with speedboats, cameras and a helicopter.... Background: I am manager at Sunrise Divers, based at Karon Beach in Phuket. 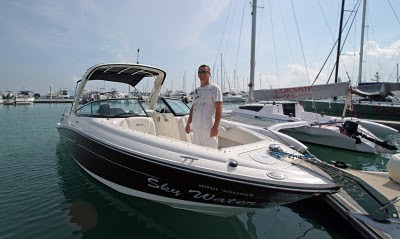 The owner bought a very nice speedboat last year and we're going to offer the boat for private charters - not diving, but cruising, sightseeing, getting out to offshore islands, off the beaten track a bit. 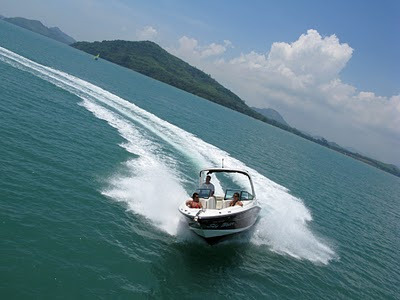 The boat is called Sky Water, it's a Sea Ray 26 foot sports boat, top class, very nice.. not your average Thai speedboat. It's available for charter for up to 4 people.. can squeeze in a couple more, but it's not a huge boat. 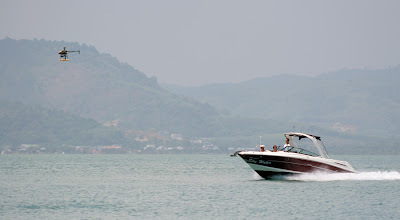 The waters around Phuket are dotted with small islands. Some are very popular like Phi Phi or Koh Khai. Other islands are less well known. The Sky Water can take you wherever you want. Damn, I want one too! 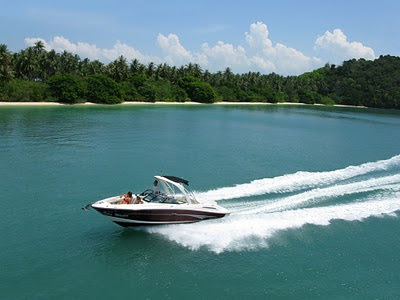 It was just 15 minutes cruise to reach Koh Rang Yai. The day was all about photos. We met the guys from Helicam at Ao Po. 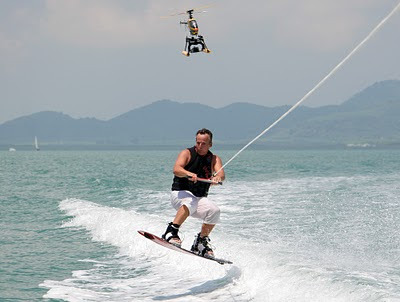 Helicam specialises in taking aerial photos amd videos. 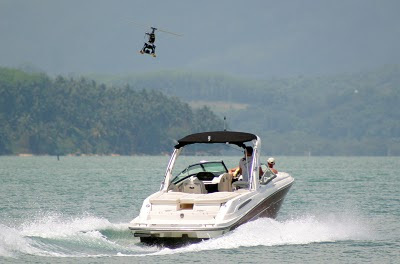 They do boats, hotels, private houses and much more and get some amazing photos - their website is www.helicam.asia. It happens that I know Phil, one of the owners, as our kids go to the same school. On Thursday Phil was joined by Khun Moo - Phil is the helicopter pilot (remote control) and Moo the photographer. The boat captain upped the revs, Phil piloted the helicopter behind Gilbert on his wakeboard and we flew past the beach a couple of times. 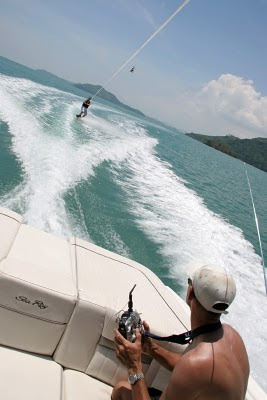 Now, Gilbert's not a wakeboard champ, but enjoys a bit of a go - anyone chartering the Sky Water or a similar boat can also do some watersports - there's plenty of quiet water on the East coast of Phuket, ideal for a quick wakeboarding session. 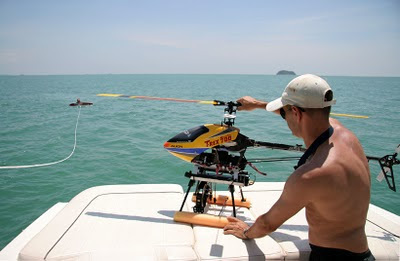 I took some photos from the boat... waiting for some pics from Helicam.. and (I have seen some previews) they are good. Great company they are, Helicam - if you want aerial photos, check their website: www.helicam.asia. After the photo session we threw the anchor, swam ashore and had a couple (ahem, I had more than a couple) of beers and some food at the restaurant at Koh Rang Yai - food is tasty, also not cheap at all! 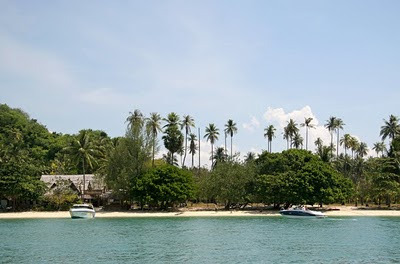 Well, occasionally Paradise is worth it - you can stay at Koh Rang Yai in simple bungalows for 1000 Baht per night. After the drinks we carried the Helicam gear back to the boat and sped back to Ao Po in the afternoon sun. In this weather, a day on the water is always a pleasure. And yes I got a bit too much sun, but since I work in the office 6 days a week, too much sun is a luxury!